Are white towel rails easy to clean? Towel rails with a white finish are simple to clean and they won’t show marks and fingerprints as easily as a metal finish product. For the most part, you will only ever need to give your towel rail a wipe with a soft, damp cloth when you find it’s getting a little dusty, but if you need to give it a more thorough clean, you can also use warm soapy water. Diluted white vinegar can also work well on tougher marks and stains. When cleaning your white towel rail, never use harsh chemicals or abrasive scouring pads as these can damage the finish. In the case of epoxy coated ladder rails, this can also expose the steel housing beneath, which can begin to corrode in a moisture heavy atmosphere. Should I choose a ladder or a glass panel style towel radiator? Traditional ladder rails and glass panel rails are very different, so your first consideration should be which of these is going to look best in your bathroom scheme. Modern style homes with a more minimalist interior may want to opt for the sleeker look of glass panel towel rails, whereas bathrooms with a more retro feel may be best served by a ladder rail, as these typically suit the majority of décors. Some ladder towel rails have similar functions to glass panels, so you can still have a programmable heating schedule no matter which style you decide upon. Another consideration you might want to make is how many towels you expect to be in use on your rail at any given time. As most glass panel products come with fewer rails compared to ladder-style models, it may be better to choose the latter of the two types if you need it for an active main bathroom. Do I need a towel rail with a thermostat and programmer? This all depends on how you intend to use your towel rail, but, in most instances, you’ll find the extra thermostatic controls and programming options very convenient. For those planning to install a towel rail in a guest washroom or infrequently used second bathroom, you might not need the full gamut of control facilities available. You may only need simple on/off controls for when the bathroom occasionally gets used to provide on-demand heat when required. A higher level of control is usually required in main bathrooms where members of the house are constantly coming and going at the beginning and end of the day. Programming functions can be very useful in these situations as they allow you to pre-heat your bathroom before everyone starts their morning routine, ensuring that nobody wakes up to a chilly bathroom. Then during the day when your home is unoccupied, you can either have your towel rail switch off or operate on a low level to maintain an ambient temperature. Thermostats complement programming controllers as they prevent the towel rail from wasting energy by overheating. What is the difference between dry and liquid thermal elements? Towel rails that use liquid thermal elements have a specially formulated fluid within the body of the heater that is designed to retain heat and spread warmth evenly across the housing. It can take them a little longer to heat up compared to dry thermal element towel rails, but their unparalleled heat retention means that they stay warmer for longer, even after they’ve been switched off. Dry thermal elements use very fine filaments of wire stretched through the heater body to produce effective radiant heat. Towel rails with dry thermal elements are more responsive than thermal fluid towel rails: they heat up and cool down faster. This can be an advantage if you want use your towel rail on-demand. Both methods of heating are very energy efficient and the only real difference they will make to you as the end user is perhaps whether you prefer the slow, enduring heat of liquid elements or the rapid response of dry systems. In a modern bathroom, nothing beats the cleanliness and purity that a white interior invokes. For those favouring this popular colour scheme, matching your heat source to the rest of your décor can enhance the overall look of your bathroom. 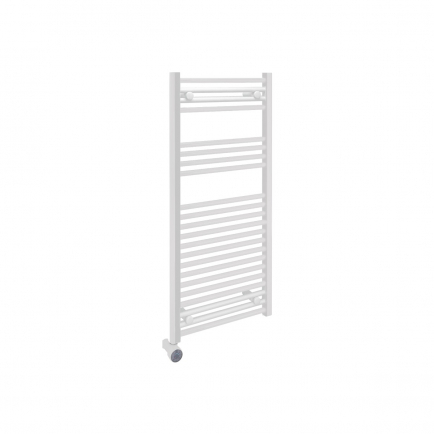 A white heated towel rail is a practical yet stylish method of heating your room whilst warming and drying your towels. We have a wide range of white heated towel rails in various sizes and styles, including traditional ladder-style radiators and contemporary glass rails. If you are looking to reduce your energy consumption, a heated towel rail with a thermostat or programmer can give you greater control over your heating and may help to reduce your energy bills.